Ashburton Grove - Arsenal news and Arsenal opinion: Wenger predicts great things for midfielder -AOC recalled? -Walcott waiting for call? Wenger predicts great things for midfielder -AOC recalled? -Walcott waiting for call? Well it's Stoke today and there isn't much love lost between the two sets of players, both managers and both sets of supporters. It's fair to say we hate each other and there is certainly some niggle when it comes to this game. Last season we managed a rather comfortable 1-0 win at the Grove in a rescheduled fixture which was the start of our downfall. Originally due to be played in December, it was rearranged for February due to the snow. And whilst the result wasn't bad - a goal for Sebastien Squillaci, we lost Cesc Fabregas after 14 minutes and Theo Walcott was stretchered off after 70 minutes. Neither would play a part in the Carling Cup final four days later. Had we had both players fit, the result against Birmingham may have been different. So we owe putting them to the sword in my book. Ahead of the game you would expect to hear Arsene Wenger agreeing with Tony Pulis about tackling, but he is. It hasn't been unheard of for Wenger to trot out the line about a beautiful tackle being as important to the game as an excellent goal or a defence splitting pass. But when it comes to Stoke's robust approach to the game, Wenger isn't at odds with Pulis when he talks about tackling being an art. "Tackling is a technique and if it is done well, with the desire not to hurt but to win the ball, it is a fantastic technique. "We had plenty here. Campbell, Bould, Winterburn, Dixon … That whole generation. I personally like players who are brave, but with the right spirit. I think the bravest players I have met were physical, but didn't hurt people. "Usually the players who play to hurt are cowards. I am not sure if referees always make the difference between what is the right intention behind the tackle." Which brings us on to Ryan Shawcross vs Aaron Ramsey which we all know wasn't a fine tackle and the Stoke man had little intention of winning the ball and more of a desire to stop Ramsey playing - which he did and not just for the remainder of the game. Ramsey doesn't like speaking about the incident or looking back at it but I think it's fair to say it's made him a stronger person. I think on Wednesday night we saw what an important player he can and will be for this club and I'm glad he's moving back towards some of his best form. It was good to see the manager take him out of the team to recharge his batteries last weekend and for the majority of Wednesday match. He's played every league game since the beginning of the season and I think we could see there was pressure on his shoulders to perform to the standard of Cesc Fabregas straight away following the Spaniard's departure. We can't expect Ramsey to become Fabregas overnight. What hasn't helped the Welshman is those around him haven't taken a fair share of that work load. I think Mikel Arteta has been disappointing. I have really been expecting more of him. But I suppose he is a new player trying to find his feet at our club. I would like to think moving from Everton to Arsenal is a step up, so perhaps he's still learning about the new role he's being asked to play. And as you would expect, the Sunday newspapers had to ask about the Welsh international because of the opponents when they met with the manager on Friday. "He’s getting back now Aaron. He’s gaining his touch again now, which he lost a little bit for a while. The speed of movement of his feet is there again now but that takes a long time. "He’s a different player to Cesc because he’s more a guy who will run into box at right time, a finisher. He has quite a good vision once he has the ball at his feet and Cesc is certainly an example to inspire him. 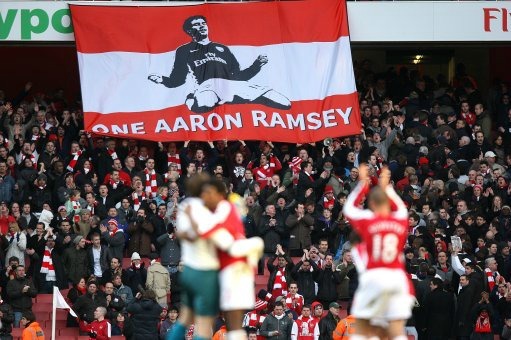 "But Aaron has strong physical qualities: he is a strong runner, he is quick. And if he develops his game well he can finish the season in double figure for goals." I think that Ramsey has had to grow up fast because of all the things which have happened to him recently. He' been appointed Welsh captain and has been given Fabregas' role since his departure. A lot of weight is now on his shoulders and with this extra responsibility comes expectation. I think so far he's handled it well and hopefully his goal on Wednesday will reinforce his confidence. Another goal today would go down well and I expect the manager to pick the Welshman to start. I think the team will be the one which finished the game in France, with Theo Walcott being the exception and replacing Tomas Rosicky. I think it'll be: Szczesny; Djourou, Mertesacker, Koscielny, Santos; Song, Arteta; Walcott, Ramsey, Gervinho; van Persie. I hope we'll see Alex Oxlade Chamberlain on the bench for this one. I know none of the senior players are injured but he does having something special which we seem to lack from the bench when he's not there. If you're going to the game today, there is the chance to stay on and watch the under-18s play a friendly match with Chelsea. This is all because the Victoria Line is out of action so the club working with TfL want to stagger the number of people using the tube. Expect the Piccadilly Line to be very busy. Finally, it you'd like some extra reading Theo Walcott is interviewed in the Sunday Mirror. "The team morale at Arsenal is great – the best it’s ever been." I think the guy is living in another planet to everyone else. The best it's ever been? He really must be on something. Walcott's also asked about sitting down with the club and talking about a new deal. he says "Hopefully, we will sit down with the club and hear what they have to say." Is his agent still waiting for the club's phone call?